Punto Bianco in DumboThanks from the F train. Dumbo’s Food Scene Just Keeps Growing: Wild Rise Pizza Pop-UpGrimaldi’s should still be okay. One Girl Cookies Expands Under the BridgeThe food scene in Dumbo is finally catching up. Confused Hecho en Dumbo Space Now Confidently Called AlMarDumbo dwellers have high hopes for AlMar. Colonie’s Brad McDonald Confirms New Restaurant in Dumbo, Reveals MoreThe Noma-trained chef says the produce will be local, but there won’t be any reclaimed wood in the dining room. 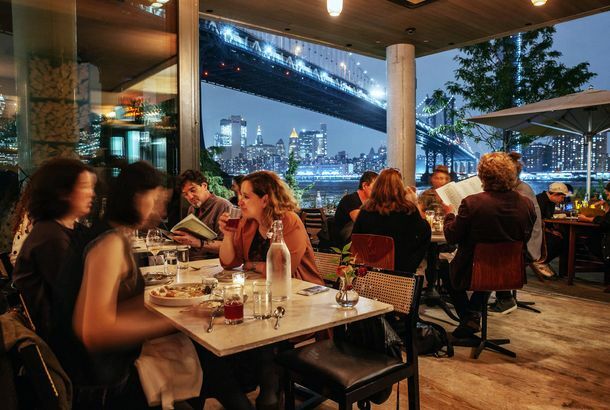 A Lamb Dinner to Celebrate Spring; Drink Austrian Wine on St. Patrick’sPlus: 50 percent off pizza, an Allman Brothers happy hour, and more, in our daily roundup of neighborhood news. Despaña Opens Wine Store in Little Italy; Perilla Launches New Winter MenuPlus Sixpoint Brewery celebrates its sixth anniversary in Prospect Heights, and more, in our daily neighborhood watch. Gastropub Theater Will Open in Dumbo on FridayAre hipster movie theaters the new hipster bowling alleys? Pedro’s Patio Comes Back From The DeadAnd Bobo’s garden is reopening also.